As you can see, our Commodore 64 is a hark back to the days of yore, running as it does with a CPU capable of a massive 1MHz. This apes the MOS6510 chip used in the original C64, which ran at 1.02MHz for the NTSC (i.e. 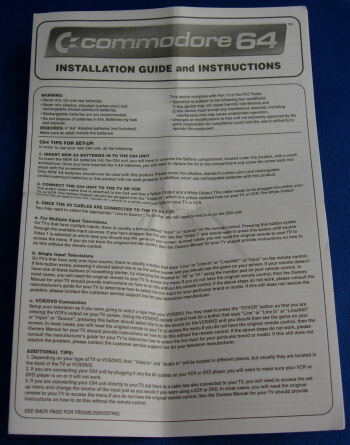 US) version of the computer, and 0.98 MHz for the PAL edition. On the memory front, we can see that the device in fact contains 128KB of RAM, double that of the 64KB found in the original C64. 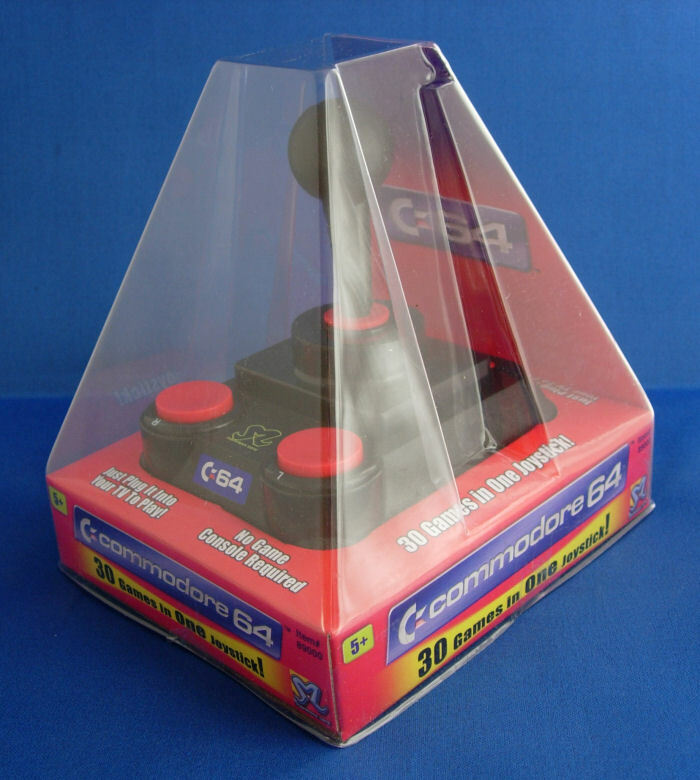 Also housed in the device is a 2MB ROM, to hold the games and software required for the C64 to run. The device outputs a 256 colour image to your TV screen by way of a composite video cable, and also outputs mono sound to your TV as well. The original Commodore 64 used a 3 channel MOS 6581 chip to deal with audio - I'm not sure how it's handled in the new version, but the sound produced certainly seems faithful to the original. 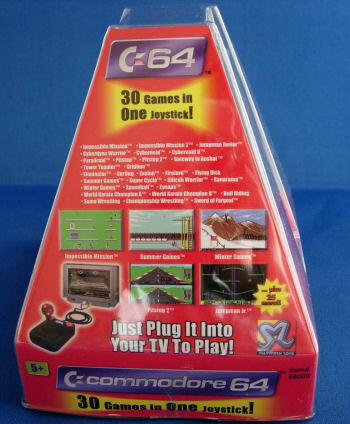 This is where the die-hard Commodore fans among you will start to get disappointed - The new C64 isn't really a full-blown computer like its predecessor, simply a joystick (modelled around a Competition Pro 5000 joystick from that era - I remember having one myself) containing all the hardware which plugs in to your TV. The device comes in a pyramid-esque package, which shouts from the rooftops about its main feature - The fact that the 2MB ROM chip inside the device comes packed with thirty classic C64 games you can play. 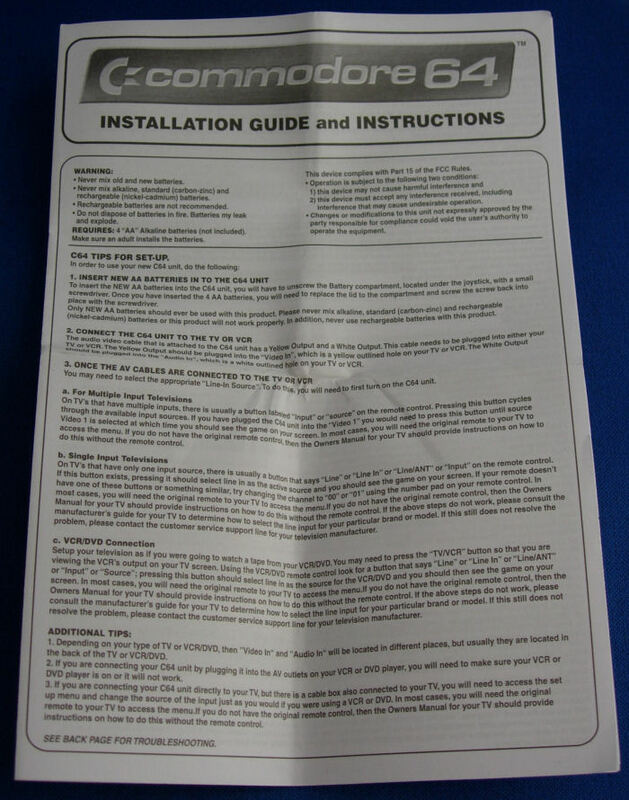 The C64's manual contains information about setting the device up through your TV, followed by brief instructions for all of the games included. However good you may think your memory of old games is, you'll no doubt find yourself referring to this at some point!